Thomas Love Latta was born on September 24, 1865, the son of William Sutton Latta, M.D., and Margaret Eckert Whitehill. He entered the University of Pennsylvania in 1883 as a freshman in the Class of 1887. Latta compiled a very distinguished record in collegiate baseball, playing the position of catcher. From his freshman year he was the member of the College baseball team as well as the baseball team of the Class of 1887. He was also a member of the Freshman Class Athletic Committee. During his junior year, Latta served on Penn’s teams for tug of war as well as baseball, at both the class and the collegiate level. During Penn’s spring sports season, he was also able to win the shot put with a throw of 30 feet 3½ inches. 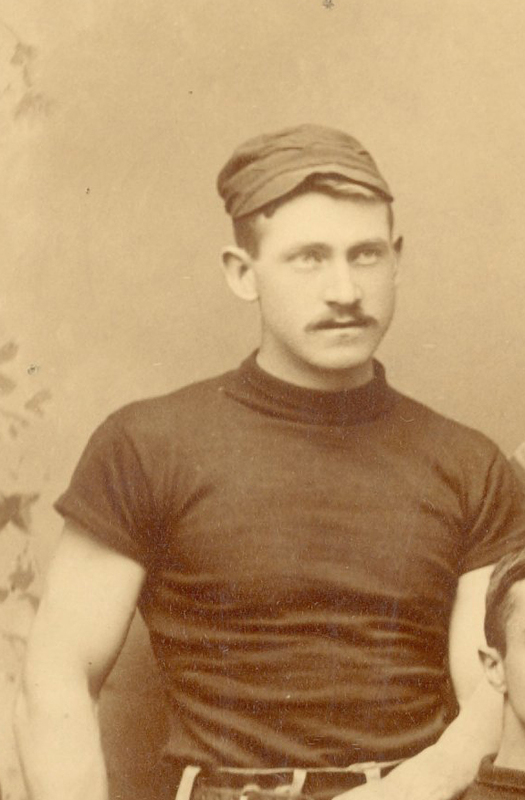 The 1887 Record shows that during his senior year, Latta was again a member of two collegiate-level teams, for baseball and tug of war. At the class level, he served on the teams for baseball, football, and tug of war, holding the position of captain for the latter; he also won the running broad jump and the shot put for his class. He also played a slave in The Acharnians, the Greek play performed in 1887. As an undergraduate, Latta served as one of the athlete models for Eadweard Muybridge’s landmark study, Animal Locomotion. A student in the science departments, Latta became a contractor and civil engineer after leaving the University of Pennsylvania. Later on he was a life trustee of the Presbyterian Hospital and president of the Children’s Cruise and Playground Society. At the time of his death in January of 1961, Latta was Penn’s oldest living alumnus.